Running Press Adult, 9780762461691, 224pp. 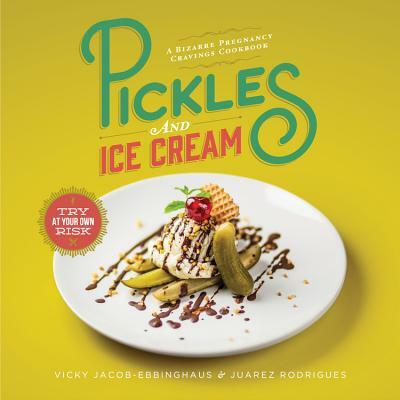 An ideal gift for expectant mothers and a celebration of pregnancy's strangest urges, Pickles & Ice Cream parodies the inexplicable epicurian desires of pregnancy with beautifully styled images, actual recipes, and deadpan humor, all based on the popular blog. Pregnancy is known for eliciting some of our most outlandish food cravings-it seems gestating a small human being can really mess with our taste buds. Award-winning advertising execs Vicky Jacob-Ebbinghaus and Juarez Rodrigues were curious about the peculiar food choices of their expecting friends and colleagues, so on a lark they compiled some of the most bizarre combinations that women shared with them: Bacon Mars Bar Burgers, Oreos and Toothpaste, Buttered Watermelon, and many more. They treated each dish as a haute cuisine creation, artfully styling them as lovingly as any top chef. Pickles & Ice Cream is a collection of their work-65 of the best, most curious, sometimes outrageous, at times oddly delicious food combinations. The book's ingredients of sleek styling, beautifully photographed recipes, and deadpan humor come together to make a perfect gift for any mom-to-be. Juarez Rodrigues is a distinguished art director in the field of advertising. After studying in his native Brazil and Germany, he began working as an art director in Hamburg while also pursuing his passion for photography. Incapable of sitting still, Juarez keeps a list of "Personal Projects" to channel his creativity-including this Pickles & Ice Cream Cookbook.